I have worked with customers who have only had a requirement for the security use case for specific projects such as securing virtual desktop environments and others who have deployed the entire SDDC stack for a developer cloud environment with security and disaster recovery. Previously NSX was only available in a single edition which provided all functionality irrespective of the customer utilising or requiring that functionality. I feel this is a tremendous step forward as the majority of objections that I receive from customers is around cost of the full license when their only requirement is security. 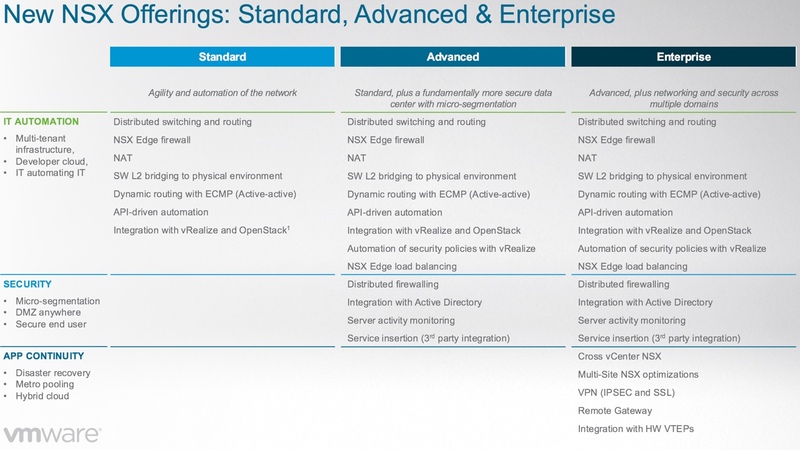 NSX also requires the vSphere Distributed Switch (vDS) which only comes as part of Enterprise Plus licensing. If you are running vSphere 5.5 U3 or vSphere 6.0 onwards then the the vDS license comes with NSX so there is no longer a requirement for Enterprise Plus licensing from an NSX perspective. This KB article explains the licensing requirements for NSX. For existing customer who have already purchased NSX you will automatically be upgraded to the Enterprise edition which unlocks all functionality.